"These moist cupcakes made with lemon pudding are topped with lemony cream-cheese frosting. " Beat first 5 ingredients in large bowl with mixer on low speed 1 min. or until dry ingredients are moistened. (Batter will be thick.) Beat on medium speed 2 min. Spoon into 24 paper-lined muffin cups. Bake 21 to 24 min. or until toothpick inserted in centres comes out clean. Cool in pans 10 min. ; remove to wire racks. Cool completely. Beat cream cheese, butter and lemon juice in large bowl with mixer until well blended. Gradually add sugar, beating well after each addition. Spread onto cupcakes. Childhood favorites are berry good together! Substitute: Prepare using Philadelphia Light Brick Cream Cheese Spread. Special Extra: Add 1 tsp. lemon zest to frosting before spreading onto cupcakes. 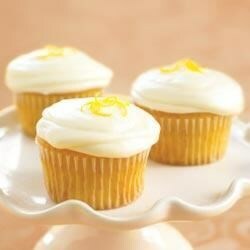 Garnish each cupcake with a small twist of lemon peel. The sponge was great. The icing however left little to be desired. Love, love, LOVE this. It is so light and airy. A BEAUTIFUL cake and it tastes delicious!! Love the lemony flavor and it's not to overpowering. These came out great for my neices birthday.